High Jumper Z’Niah Hutchinson, Javelin Thrower Arianna Hayde and Shot Putter Djimon Gumbs all established records, during the 2016 BVI Athletics Association National Jr. Championships, which also saw a number of personal best performances. Soon to be 15-year old Hutchinson equaled the National High Jump Record of 1.65m, first established by Virgin Gorda’s Tkola Creque in 1994 and matched by Chantel Malone in 2008, when she cleared the height on her second attempt. Hutchinson who entered the competition with a best of 1.61m got over the bar at 1.68m, but was still on the High Jump bed when the bar fell off and was not credited with the outright record. Her mark also took down Malone’s U16 record of 1.60m from 2005. In the same event, Malone’s sister Xiomara—soon to be 14—finished second in a personal best of 1.60m, improving on her previous mark of 1.56. It’s the fifth best performance by a BVI athlete behind Creque, Malone, Hutchinson and Pat Archibald. Hayde eclipsed Tynelle Gumbs’ 2012 Javelin Throw mark of 41.46m with a heave of 41.47m with the 500g spear, becoming the second U18 Girl to over 40m. U20 Girl Britney Peters had a 39.42m mark with the 600g implement. Djimon Gumbs put the disappointment of fouling out the Discus Throw behind during Saturday’s morning session, by unleashing a National Youth Record throw in the Shot Put, to close the championships during the evening session. 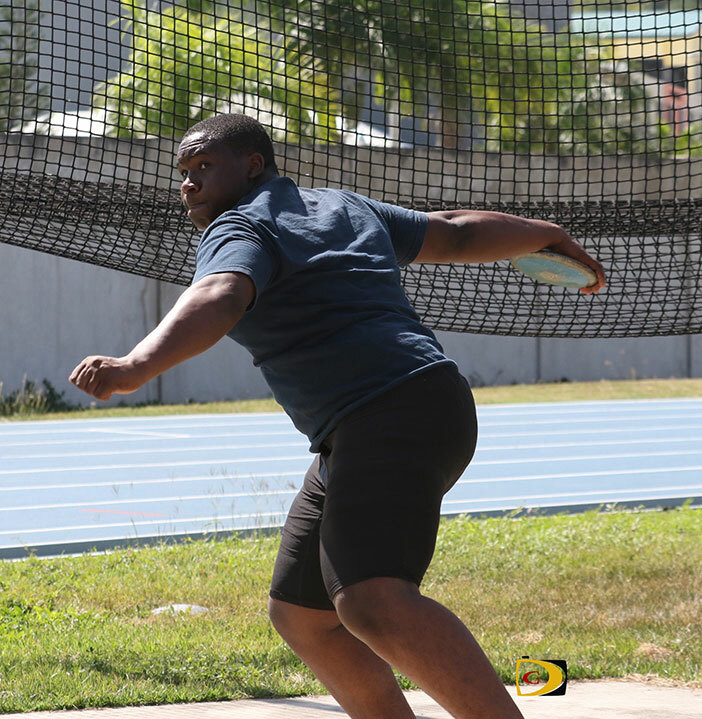 Gumbs—who also took the Javelin Throw with a 42.02m effort—upped his own record mark from 15.58m earlier in the season to 16.33m on his first throw in the U18 Boys event. Soon to be 15-year old Beyonce DeFreitas, won the U18 Girls 200m with a personal best run of 24.42 seconds, lowering her best of 24.50 from last year when she was fifth in the Carifta Games. Her time broke Nelda Huggins’ 2012 U16 record. She ran 25.00 in the prelims. Judine Lacey became the ninth BVI female athlete running the 400m under 56.00 seconds, when she took the U18 Girls final in 55.92, improving on her 56.04 in Friday’s prelims, behind Lakeisha “Mimi” Warner’s 55.88. Warner did not contest the final, improved her 3-year old best from 56.49. Anguilla’s Artesha Richardson established a national record of 56.74 seconds in placing second behind Lacey. After laying off the pace in the 400m set by Ronique Todman, who ran 10.99 to win the 100m, St. Croix’s Rodney Griffiths overhauled Todman in the closing stages of the race to win in 48.63 seconds to Todman’s 48.85. St. Croix’s Barthelemy Peter was third in 49.43. Todman took Friday night’s prelims in 48.85 to his 48.92. He returned to run a personal best of 21.88 seconds to win the 200m becoming the 12th BVI male athlete to go under 22.00 since 1978. Griffiths followed in 22.42. A notable performance came from soon to be 16-year old Rakeel Jack, who went under 50 seconds for the first time, running 49.50 in the prelims and 49.88 in the final as a school boy. Josh Hill sliced his U18 Boys 800m meter best from 2:02.98 to 2:02.52 to win the race.